Paintings - "History, Give or Take"
This painting was conceived, researched, and meticulously painted over a two year period. The globe is as seen from space. The cubes are of the monarchs, as of 1,350 B.C.E. to the present, being let fall from the milky-way sack by the great hands of a metaphysical Overseer. 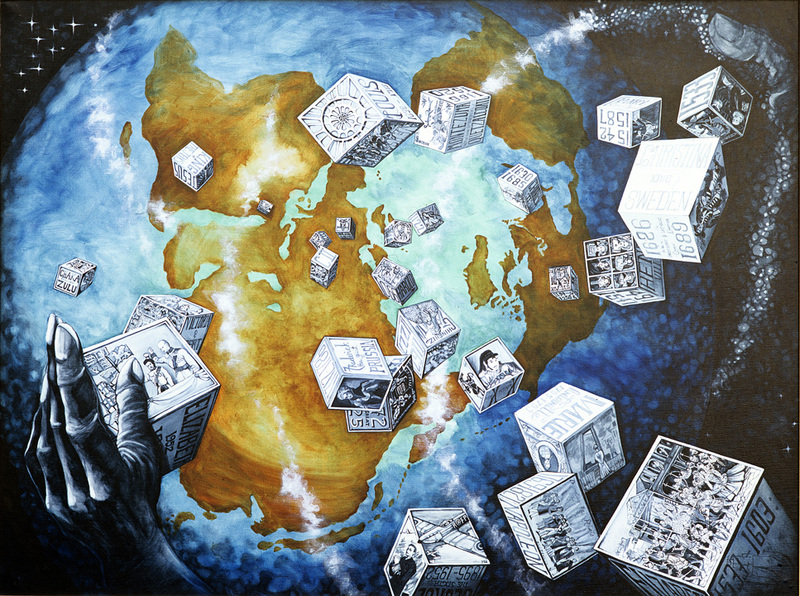 Each cube, like the roll of a dice, depicts the effect of a single person on history, since Egypt’s Ahknaton, proceeding through Roman numerals to Arabic and ending with Queen Elizabeth’s reign (coronated in 1952). Within each cube is a metaphysical reconstruction of the essence of the specific time-period, in miniature, from Gengis Kahn’s pillage, through William the Silent’s rescue of Leyden, to Louis 14th’s high-heel fashion. Even Chaka Zulu is there! And though each of those monarchs has had an imperial and lasting effect on mankind, (after all, were history not as it were, you and I, precisely, may not have been born), what is even more interesting is what might have happened had they not been The One to dictate, but some other one. What’s on the other side of the dice? Well, WE are now at the stage of collectively choosing our controllers, and as much as we can exercise our own vote, and influence others, so we may sway the future. Giving or taking. That’s the title. It comes down to self-centeredness, or contribution to the health of the whole.